A decade ago LG was one of the prominent mobile manufacturers and they couldn’t withstand heavy competition from their rivals later and eventually they lost most of their market share. They are still searching for their place in the modern mobile market. Many of their most expected models couldn’t finish well with leading products. But the current trend seems to be hopeful for them. They have gained much from the third quarter of this year with some exciting tablet Pcs. Following this they have announced their latest Hybrid model LG Tab Book Duo which is a Windows 8.1 based Device. Hybrid computers are now highly in demand and conventional tablets may disappear from the market in near future. This can be considered as a great move from LG. 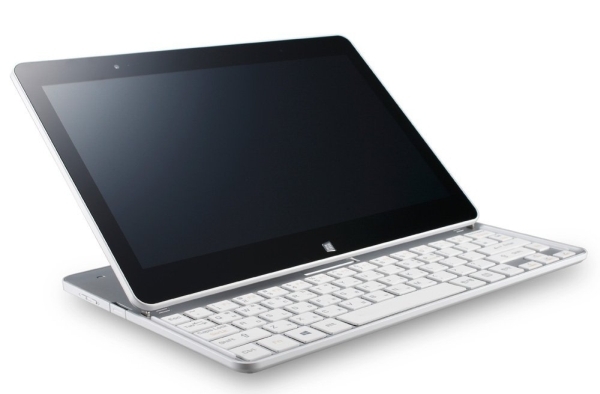 Tab book Duo can be converted to a notebook PC from its tablet design in no time, thanks to the add-on keyboard comes with the PC. LG Tab book Duo enters the market with style. This tablet PC weights only 530gms and is easily portable. The device is extremely user friendly with its unique design and not so amusing with the limited features. The most significant part of this model is the add-on Bluetooth keyboard for its versatility. The design also comes with a kickstand to keep it in upright position when needed. The model consists of a 10.1 inch IPS display. LG hasn’t revealed about the resolution details yet. Still many of the models in the same category supports full HD display and LG may consider this seriously. The current trend of tablet makers to prefer Core M processor than the successful Atom model is being followed here. LG has included the latest Core M processor which has the ability to reduce power consumption noticeably. Core M processors are capable to adjust power usage according to the purpose. Different power modes can be implemented for both tablet and notebook usage. According to them the device battery is capable of giving 11 hours continuous supply and the Core M processors play a great role to achieve this. Also there is no hint about the RAM and storage capacity of the device as well. Even though they have provided the latest USB 3.0 feature, there is no camera facility available and is a big setback to the device. They have not even included the 3G support in this 4G era. LG needs to be vigilant in order to satisfy their customers in future. The model has white and black variants which will cost around $670. This seems to be costly as the device has nothing much to offer except the unique design and long battery life. If you purchase the device before 22nd December, LG offers you the Microsoft Wireless mouse for free. Now it’s the turn of market to decide the fate of this product.